I swept along with the crowd surging down Bourbon Street in New Orleans. The scents of booze, garbage, fried cooking and perfume mingled in the air, surrounding me with their confounding aromas. Live music blared from bars, street musicians and stages.The party was in full swing. 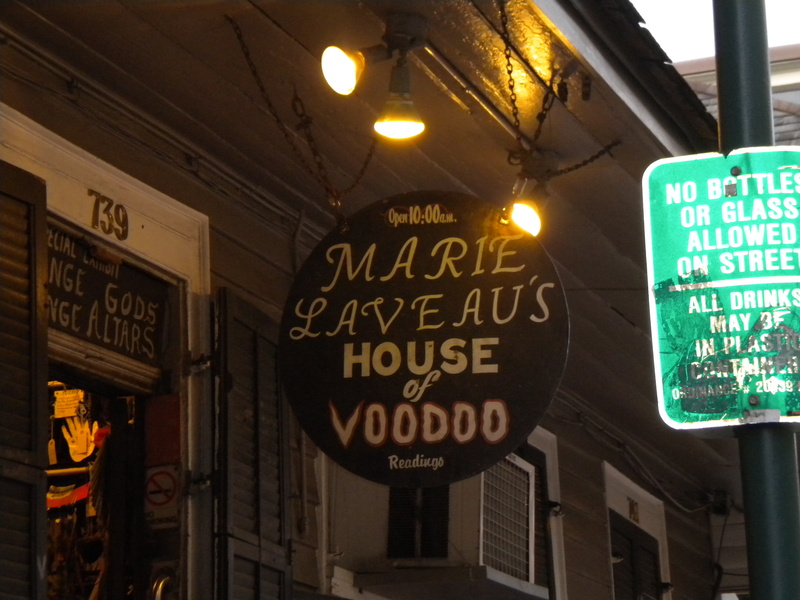 I slipped away from the swell of people onto a narrow sidewalk – above me hung a wooden sign: Marie Laveau’s House of Voodoo – Readings. I parted the hanging beads and slipped into a tiny room. The man behind the small table gestured for me to take a seat on the other side. He introduced himself as Jeremy and asked me to hold my right hand, palm up, under the sallow light of the lamp. A pale glow swathed the walls creating a dusky atmosphere. The energy from hundreds of people dangled in the air. I amused myself by speculating on what secrets he discovered in them and what he might discover in me. Four days later, I returned to the shop, only to be beckoned into the back room by a woman who had clearly seen many years on this earth. She sat at the same small table under the same sallow light and gave me an identical reading to the one I had only days ago. She pointed to the same line break on my palm and said, “Arthritis troubles you.” Somewhere from the eaves, I swore I heard an old crone cackle. Wow JGC isn’t that strange, maybe even kind of freaky. So glad you got to go on holiday. Maybe you can find someone down there to stick a pin in the old lady and get her to go elsewhere. Love the way you write. How weird! I was walking down Bourbon Street myself just a couple of weeks ago. It is a unique place even in broad daylight. Irma, I really enjoyed visiting New Orleans. It was such an interesting city, I look forward to going back. Loved the time I spent in New Orleans! Such a funky fun place. Loved your story.. Thanks Sandi – I would love to return again. It was a beautiful and fascinating city. Oh Julia, you spin such a clever, wise and crafty story. Thanks.